It’s very likely another store will have the same item, and you can always come back if you struggle to find it else where. 100% of shopping is driven by emotion and the store owners know that. A lot of travel websites out there will tell you that you should start the bartering process by dividing the asking price in half and work up from there. Your final price should be somewhere halfway. However, I find that this rule, whilst is a great start, is not always applicable. For example, we managed to barter a $75 bottle of perfume down to $7.50. You will quickly learn what the average ‘going rate’ of certain items are. So make sure you decide how much you are willing to pay before you engage in bartering. Once you name a price and the seller agrees, you are most certainly inclined to purchase it. And once they agree on a price, you can’t expect to barter lower. If the seller isn’t willing to negotiate down to your price, you should be willing to walk away. More often than not, when you start to walk away the seller will call you back and sell you the product at the rate that you are asking for. If not, you can probably assume that the price you are willing to pay might be too low. 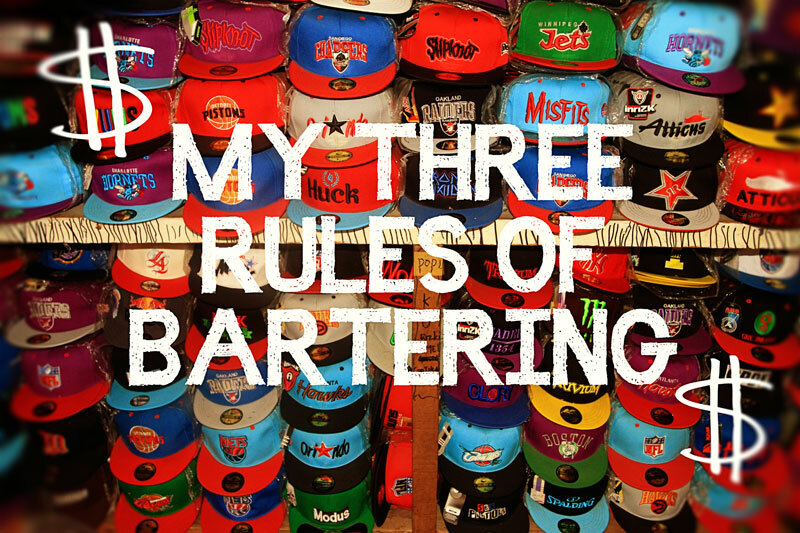 There is more to bartering than these three steps, but I find them to be pretty good rules of thumb. Oh, and lastly, be friendly. Try not to get into an argument over the price. It can be very tempting to get frustrated, especially when the sellers become pushy. If they’re not willing to meet your price, laugh it off and go somewhere else. Remember, these sellers are also trying to make a living so don’t insult them by being rude over $2. That’s just not cool. Play nice, be friendly and hey, if they like you they’ll be more inclined to give the item to you at a cheaper rate.